My leg was stretched in the roll cradle when the Technical Manager came through the warehouse door. “No problem here” he said. Not even questioning why a Human Resources Manager would be in the warehouse with her leg raised in the air. He walked back to me. Smiled. Lifted my foot from where it had gotten wedged into the crook of the iron. “No problem here,” he said and continued on. The next day, I was in the warehouse swinging my leg to reach an upright when the Maintenance Manager came by. “Beth, don’t hurt yourself,” he said. “You guys must have moved these uprights. I could reach them last week.” He chuckled. I’m aging. I’ll be 60 years old next month. I still want to climb mountains. 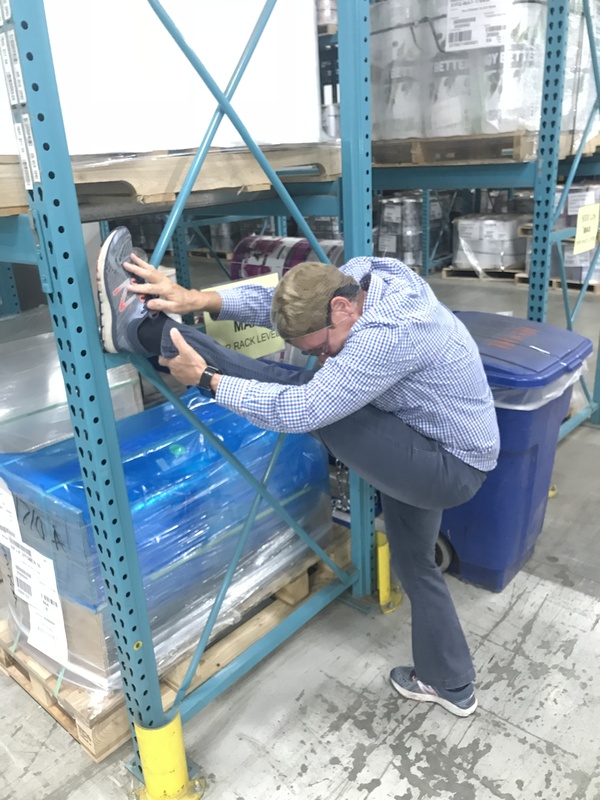 I’m finding that I’m not as limber or flexible, and it’s harder to keep the weight off. At my last physical, I told the doctor that even though I’m biking every day, my weight is exactly the same. She finished injecting cortisone in my right knee. I have osteoarthritis in both knees. It is a degenerative “wear-and-tear” type of arthritis that occurs most often in people 50 years of age and older. When I hear of someone who has had a knee replaced, my attention sharpens. I’m afraid of not being able to climb mountains. On the summit of the Upper Mayan Trail with our guide Alex. I’m a 2nd Dan Tae Kwon Do Black Belt but haven’t been able to attend classes for a couple of years. I’ve run at least 7 marathons but haven’t run at all for at least a year. I believe I should do the things I can do. I can bike. I can stretch. I can climb mountains …. sometimes. My goal on our Guatemala trip this June was to hike the Upper Mayan Trail, hiking from the shores of Lake Atilan to Solola. Close to 3000 ft. elevation gain in 4 miles. A very steep trail, with beautiful scenery, and several encounters with local Mayan carrying firewood on their back or working in the fields. Jody and Crystel led the way, turning from time, encouraging me on. Juan Jose’ and our guide Alex were there with a helping hand. What a gift to have my son reach his hand out to take mine. And, a guide, our friend, who is such a wonderful role model for our children. I’m aging. There is beauty and grace in that. Note: the featured image is Juan Jose’, Alex, and Crystel standing on the precipice of the Upper Mayan Trail. 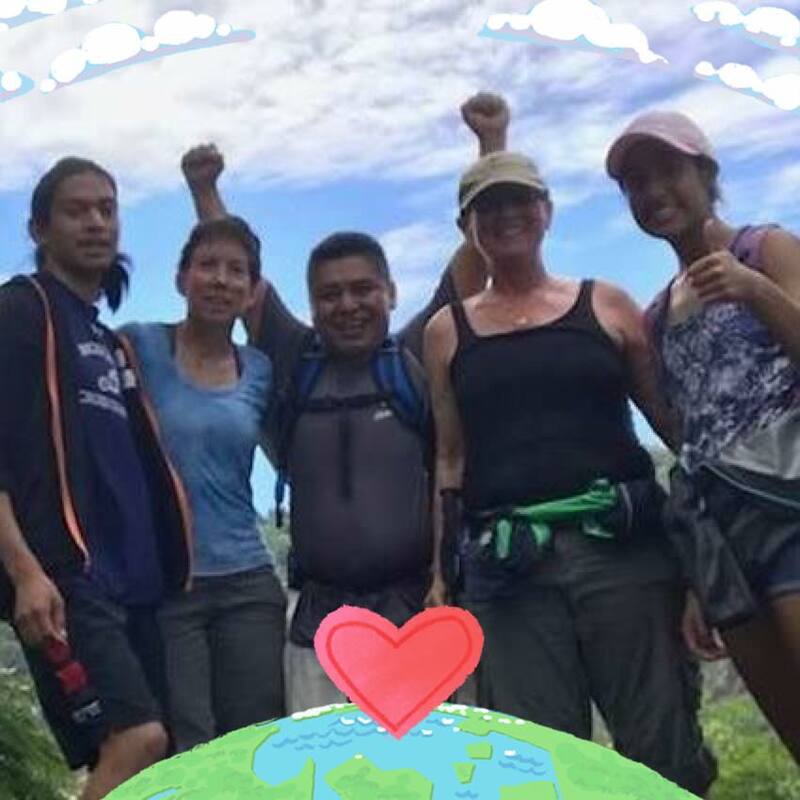 This entry was posted in aging and tagged biking, Elizabeth di Grazia, Guatemala, hiking, osteoarthritis, stretching, wordsisters by Elizabeth di Grazia. Bookmark the permalink.